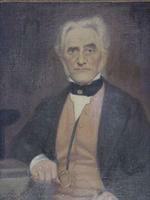 DALY, THOMAS MAYNE, businessman, politician, and office-holder; b. 17 Feb. 1827 at Hamilton, Upper Canada, son of John Corry Wilson Daly* and Leonora Mayne; m. 19 June 1846 Helen McLaren Ferguson, and they had at least one daughter and three sons, including Thomas Mayne*; d. 4 March 1885 at Stratford, Ont. 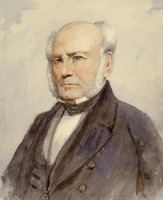 Provincial politics attracted the young businessman and in August 1854, running as an independent Reformer in the new constituency of Perth, he became the county’s first member of the Legislative Assembly. He apparently changed his political views soon after his election and in September absented himself from the assembly when the Reform government of Francis Hincks and Augustin-Norbert Morin* was defeated. He then supported the administration formed by Sir Allan Napier MacNab* and Morin and continued thereafter as a Liberal-Conservative follower of John A. Macdonald*. He was re-elected in 1857 but was defeated by Michael Hamilton Foley* in the general election of 1861 before successfully contesting the by-election when the constituency became vacant in 1862. After losing in the general election of 1863 as well as in the federal election of 1867 he returned briefly to municipal politics, serving as mayor of Stratford in 1869–70 and as reeve of North Easthope Township in 1872. Entering federal politics again in 1872, he won the seat of Perth North and acted as whip in Macdonald’s government until its resignation in 1873. Daly then successfully contested Perth North in a provincial by-election and served as a member of the Ontario legislature until he was defeated in 1875. 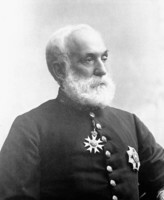 From 1876 to 1878 he again served as mayor of Stratford. Daly was not an important parliamentarian and he rarely spoke in the house. His relationship with the Conservative party during the 1860s and 1870s is, however, of interest. During the late 1850s his business empire had collapsed. Heavy speculation in land led him deeply into debt and he was unable to meet the demands of his creditors during the panic of 1857. His contracting firm declined because of mismanagement and by 1858 was under new ownership. At the end of the decade Daly was $250,000 in debt and without assets; he remained in financial distress for the rest of his life. For years Daly corresponded regularly with Macdonald on a constant theme: he was a loyal servant of the Liberal-Conservative party and in return he expected a remunerative post. In 1864 he explained to Macdonald that although he had doubts about the scheme of confederation he had nonetheless worked for it within the Orange order, of which he was provincial grand master, and in return sought the post of sheriff. When the post was not forthcoming Daly insisted that “times are so bad here that if I have to starve it out much longer, I am afraid of myself.” In 1866, because of his extensive contacts in the United States, he was employed to spy on Fenians in New York State by Macdonald, to whom he presented an extensive report. Unfortunately Daly’s contribution to the Conservative party had never been significant enough to warrant much patronage and he got no permanent post during the 1860s. 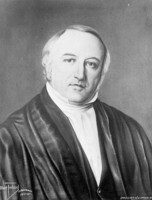 After his provincial legislative service in 1874–75 he became desperate once more. In 1877 he obtained the federal nomination for Perth North, to the dismay of Conservative organizers who were convinced that he would lose the election. Daly agreed to withdraw, in return for the promise of an appointment if the Conservatives were successful. The Conservatives did win in 1878 but Macdonald did not find Daly a post until 1884. Then, despite his being described by the minister of customs, Mackenzie Bowell*, as “a useless encumbrance,” he was appointed deputy collector of customs at Stratford. He held this post until his death the following year. Ont., Legislative Library, Newspaper Hansard, 1875 (mfm. at AO). PAC, MG 24, B60; MG 26, A. ”Parl. debates” (CLA mfm. project of parl. debates, 1846–74), 1854–63, 1873. Globe, 8 Jan. 1874, 5 March 1885. Canadian directory of parl. (J. K. Johnson), 149. CPC, 1873. Dominion annual register, 1885. W. S. Johnston and H. J. M. Johnston, History of Perth County to 1967 (Stratford, Ont., 1967). Swainson, “Personnel of politics”; “Thomas Mayne Daly and patronage as welfare,” OH, 72 (1980): 16–26. Donald Swainson, “DALY, THOMAS MAYNE (1827-85),” in Dictionary of Canadian Biography, vol. 11, University of Toronto/Université Laval, 2003–, accessed April 26, 2019, http://www.biographi.ca/en/bio/daly_thomas_mayne_1827_85_11E.html.